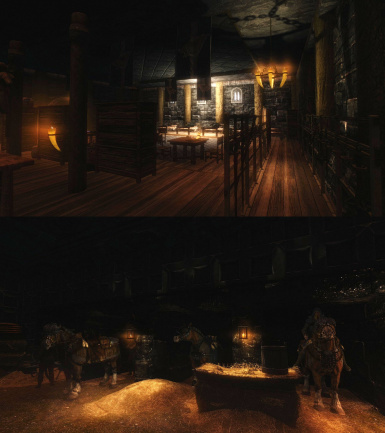 The Palace of the Kings in Windhelm is now grander, more active and lively, and have more things to see. Added the option with no lighting mods with something else. Cleaned Identical to Master records. 11/6 Re-uploaded with ELFX&3DNPC patch which apparently I forgot to include in the last upload. Improved textures for every painting. Added a couple of new scripts and improved a few scripts. Brunwulf will not be wearing Stormlord armor even if you have both Immersive Armors & Appropriately Attired Jarls installed. The War Room will be refurnished a liitle bit after the Legion takes control. The BSA archive has been resized in the process of needed repacking. Wuunferth will now wear a black wizard robe to look better in combination with his hat. Some small interior changes at the War Room in the Main Hall. A note added at the bath hall written by Sifnar will tell you at what time the people of Palace of the Kings go to bathe. Change to Wuunferth's NPC record has been removed. Now every Stormcloak-related things in the palace will be removed after the city is taken by the Imperials. Better AI for Ulfric's sellswords. They stop fighting you once their employers surrender, and leave Windhelm after the Imperials' victory. Better AI for Stormcloak recruits. If some of them survive after the final battle in Windhelm, they run to their camp in the Rift. 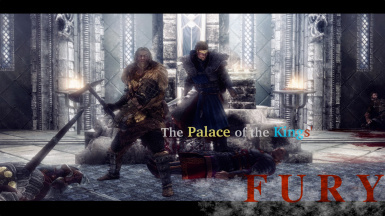 Now you can get the Jagged Crown somewhere in the palace, if you helped Ulfric acquire it. Small interior fixes here and there. Brunwulf will change his attire if he's gained the throne. His combination of wearing is unique, avoiding him from wearing Stormlord armor if Immersive Armor is installed. A new NPC, a dunmer woman, will start working at the palace once Brunwulf becomes the Jarl of Windhelm. Stormcloak Vault is now locked as it should be. All of the paintings have their textures compressed for better performance. Tiny fixes here and there. The new Palaces and Castles Enhanced is the latest version which offers much better Palace of the Kings and it completely overhauls 4 other palaces in Skyrim. Requires Updated Skyrim, Hearthfires, and Dawnguard. 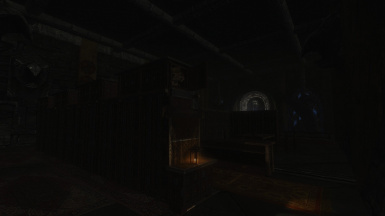 ・Enhanced 4 interior cells related to the Palace of the Kings in Windhelm, including the Palace of the Kings, the Palace of the Kings Upstairs (The court wizard's quarters), the Palace of the Kings Upstairs (The Jarl's quarters), and the Windhelm Barracks. 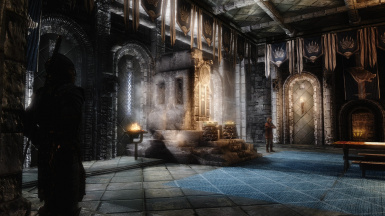 ・6 new interior cells added to be the proof of the palace's long and dark history, and the fact that it serves as the capital headquarter of the Stormcloak army. ・New AI Packages (daily schedules) for the NPCs regarding with the palace. 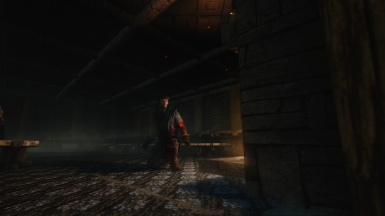 ・Over 20 new NPCs added simply to serve for the immersive experience. ・ Polished with TES5Edit. No deleted Navmeshes or Room Bounds. 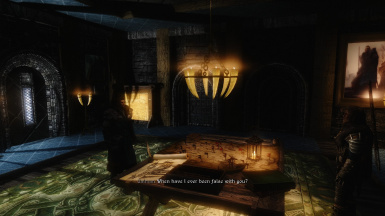 ・Support for many popular mods, including 4 major lighting overhauls! This is the 3rd of the series of my attempts to improve, or enhance 5 major palaces in Skyrim. 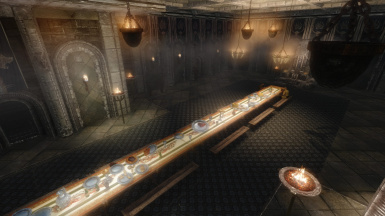 The Palace of the Kings is one of the oldest architectures in all of Skyrim still inhabited by the royal family of Windhelm. However, as if it goes against the supremacy of this glorious establishment, the original interior layouts of the Palace of the Kings and the other related cells have left a lot of visible errors that are much believable as a sign of the creators' "fast work", and that poor sense of creativity seen when you curiously go to the "upstairs" of the palace to see for something interesting, only to find bunch of the unused rooms systematically filled with boring beds that nobody ever sleeps in, which pretty much makes the Palace of the Kings the worst place to hang out in all of Skyrim. In fact, who remembers what's in the Palace of the Kings upstairs except for that enchanter's room? Haven't you ever wondered, like, there should be more to be found in this palace thinking of its long, long history? Ysgramor himself lived in here once! And that poor snow elves, don't you think some sort of evidence which indicates the palace is built upon their sufferings should've been left for us to discover? If you ever wondered like this, as I did...this is the mod for you! 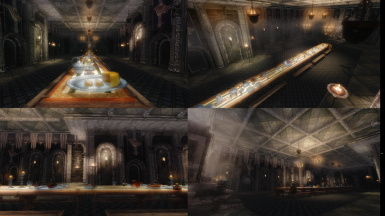 Every interior cell in the palace is remodeled, including the WIndhelm Barracks (also known as the WIndhelm Blood Works). The Blood Works is extended with more beds for the guards, and to be the central base of the Stormcloak army. Originally, the palace upstairs are just a bunch of bedrooms, which didn't make any sense at all. 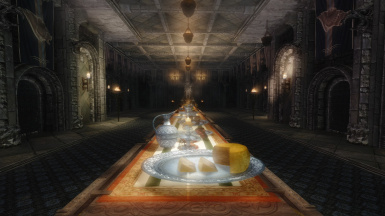 Many of these rooms were never actually used by any of the NPCs, including the one seemed like a dining hall. So I've remodeled each and every room so that they look more practical, to serve as their living quarters. There are now paintings hanging on the walls in many of the rooms. All of these paintings are uniquely done for this mod, to look appropriate when being displayed inside the palace. 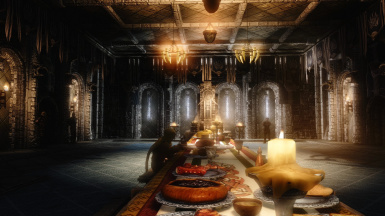 There are 6 new rooms added, including the Bath Hall, the Foods Storage Room, the Abandoned Living Quarters, the Stormcloak Vault, the Library Hall, and the Palace of the Kings Underground. They not only add some enjoyable exploring experiences but also to serve as the explanation of the untold history, and as the proof that the palace is the central post of the Stormcloaks. The Palace of the Kings Underground is a forbidden place which leads you to discover what's just underneath the Throne Room. For the pieces of the palace's dark history of Snow Elven slavery can be seen here, people have been telling the tales of the palace's haunted underground for ages. Of course, no one go in there or allow any curious adventurer to enter. ・If you're sided with the Stormcloaks and helped Ulfric acquire the Jagged Crown from Korvanjund, you'll be able to find the crown somewhere in the palace so you may reclaim it as yours. 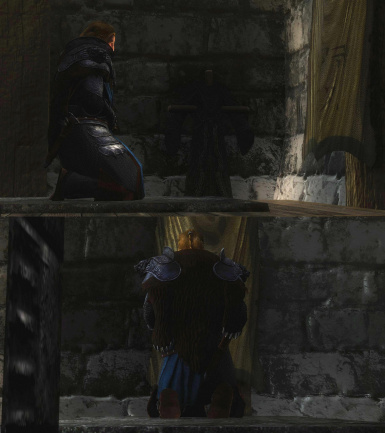 Ulfric wouldn't know it was you who took it so he wouldn't consider you as a traitor even if you do. 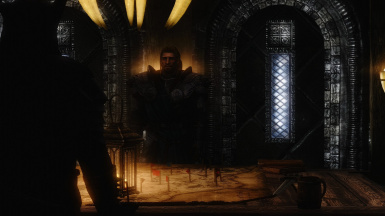 ・If you join the Imperials or you install this mod already as an Imperial soldier, you'll see some of the additions removed from the palace as a consequence of increasing influence of the Imperial Legion in Windhelm after the final fight. Also, after the reunification of Skyrim, the new Jarl will grant a dunmer woman a position as a servant at the palace, proving WIndhelm to be more opened place for those who were reckoned as outsiders. The royal people of the Palace were given the new daily schedules and are now more active and lively. In Vanilla Skyrim, the people of the Palace of the Kings had no variety in their daily lives. Think about Ulfric, every time he mentions about being a busy man I always thought that's some kind of a statement of his rude, wretched personality, because all he does is sitting on the throne all day long until it's 10pm to go to bed. He doesn't eat, or work at all. Things are worse when it's about that steward, Jolreif, he sleeps in that bed roll in the kitchen while his servant, Sifnar, sleeps in the bed in the upstairs. This makes no, no sense at all because he could just go to the upstairs and he'd find a plenty of unused beds to choose from! So everyone including the Jarl (Ulfric or Brunwulf), the Housecarl (Galmar), the Steward (Jorleif or Captain Lonely-Gale), The court wizard Wuunferth, and the servant Sifnar have been given new daily schedules. All of these people gather at the throne room at 7:00am to eat breakfast and at 12:00pm for lunch. And all of them bathe at the newly-added bath hall, having their clothes unequipped and put inside the cabinet. This is the best opportunity to steal their belongings for a thief, but beware, if you steal all of their clothes they might have to wander about the palace naked! Some of the people's new behaviors were taken screenshots and uploaded to the images section so I won't list them here. 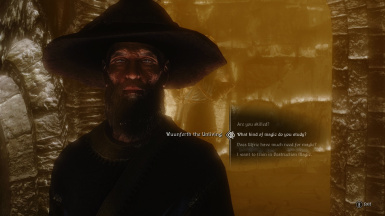 One very unique thing is what Ulfric does when he wakes up at 5:00am, he travels to the "Meditation Room" to spend his morning hours sharpening his mind, using the techniques he learned in the days of his youth as one of the Greybeards. The new NPCs are simply added so that the palace looks as lively as it should be, so every NPC has purposes for his/her existence and they have their own positions. 2 strong warriors hired by Ulfric, guarding the War Room. You might have to get past them if you're taking Windhelm city as an imperial soldier, challenging Ulfric and Galmar a final fight, which is now a more challenging task for you because each one of these sellswords is as powerful as a normal bandit chief. They will not attack you when Tullius and Rikke are having words with Ulfric and Galmar requesting their surrender so they won't bother during that scene. But they will draw their swords when the battle begins in the palace and never stops fighting you until they die, or both Ulfric and Galmar fall and their payments become unsafe. You may of course kill them both, but you also have an option to concentrate your force on Ulfric and Galmar and ignore the sellswords. If Windhelm is put under the Imperial control and yet their lives shall be spared by you, you might be able to find them again in the city where every thug in Skyrim ends up. In one of the most coldest regions of Skyrim, the supply of foods can be a very critical issue. The people of the palace would need a great deal of hard work in order to fill their dining tables with so many fresh foods. 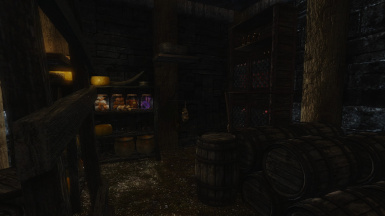 This is why I've added a new foods storage room in order to store foods, and also a new NPC named Master Huntsman. Master Huntsman is in a service for the palace to supply fresh meats from the wilds. At 4:00am he wakes up and start traveling to the woods, to hunt animals and deliver their carcasses to the palace. He also sells you some of the stuff he hunts, in order to save up some coin for a few mugs of mead. They are newly recruited soldiers who are still under training to become Stormcloaks. For now they were given an honor to guard the palace and help in forging some steels for their army. When the city is under attack by the Imperial Legion for the final battle they have no choice but to join the fight to defend it, even though their training is yet to be completed. (= If you're an imperial soldier you will face them when you attack WIndhelm but they are very weak.) If they shall survive the final fight, or you install this mod on the save where the fight is already done, they try to flee to their military camp in the Rift. ・Wuunferth the Unliving's given a new set of outfit. He now wears his own old-wizard styled hat. 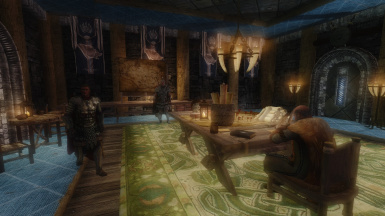 Every mod edits the Palace of the Kings, 2 of the Palace of the Kings Upstairs, and the Windhelm Barrack are not compatible. ・Inconsequential NPCs...Adds 2 servants and 2 very "memorable" Thanes, who make the palace far more interesting. ・Immersive Armors...To more heroically dress up Ulfric and Galmar. ・Immersive Music...Probably the best music overhaul for Skyrim, it adds quite a few tracks make visiting palaces somewhat overwhelmingly exciting. Some changes from Unofficial Skyrim Patch have been implemented to my mod, to avoid any issues by overwriting it. My mod does not require USKP as a master file. Brunwulf will be wearing his Jarl outfit when he's raised as the new Jarl. This is the similar feature seen in the great predecessor, Appropriately Attired Jarls mod. However, there's a problem with that great mod...when you have Immersive Armors installed, the new Jarl wears Stormlord armor like a new Stormcloak boss, since the outfit assigned to Brunwulf is identical to Ulfric's. In my mod, Brunwulf will be wearing his own set of outfit, preventing this from happening. Many, many assets from the various creative people who dedicated their beautiful works so that anyone can use them and include in their works for free are gratefully used in this mod. I hereby thank everyone who helped me build The Palace of the Kings' Fury with their wonderful creations and their generosity. As I will extend this project in the future, to merge all of the 5 major palaces including my recent works, Royal Blue Palace, and Medieval Mistveil Keep, I'd also like to credit those who helped me make them here, as they're the supporters for this extensive project. 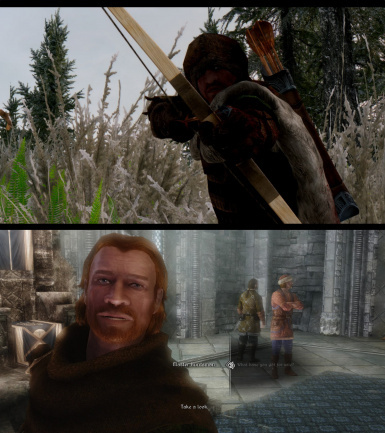 Thank you, Drunkzealot, for your Drunkzealot's somewhat historically accurate weapons 1.43 (http://www.nexusmods.com/skyrim/mods/65814). Thank you, Elianora, for your Elianora's Extra Resources ( http://www.nexusmods.com/skyrim/mods/53192). Thank you, esmm40, for giving me a permission to use your Shredded Triss Armor (http://www.nexusmods.com/skyrim/mods/18113).The original Triss armor's concept, meshes, and textures are owned and copyrighted by CDProjekt. The creator of "Palaces and castles Enhanced - The Palace of the Kings' Fury" is in no way associated with CDProjekt or CDProjektRED. Thank you, insanity sorrow, for your Static Armor Stands, Curtains, Paintings, Bath Towels, Junk Yard, Rugs, Pillows, Washing Stuffs, Soaps, and Foods Stuffs. 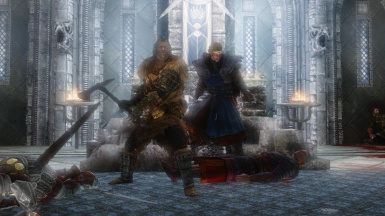 Thank you, ActusReus, for your Northman Armours - Credo StandAloneMod (http://www.nexusmods.com/skyrim/mods/26321). Thank you, Oaristys and Tony67, for your Modder's Resource Pack (http://www.nexusmods.com/skyrim/mods/16525). 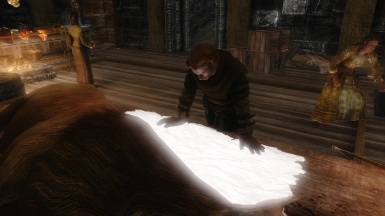 Thank you, yourenotsupposedtobeinhere, for your Rug Resource (http://www.nexusmods.com/skyrim/mods/17303). Thank you, Blary, for your Ingredients Wall Art Resource, BookSets Resource, Open Books Resource. 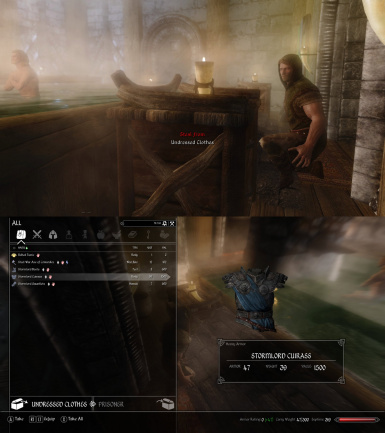 Thank you , Runspect, for your Resources for modders (http://www.nexusmods.com/skyrim/mods/26132). Thank you, LOLICEPT, for your Lolicept Resources (http://www.nexusmods.com/skyrim/mods/62733). Thank you, lilith, for your Ready Clutter and Furnishings 1.1, Catering by Lilith 1.3. 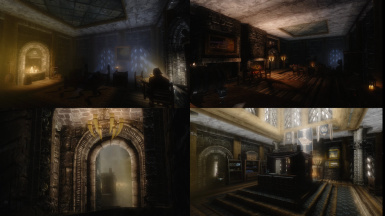 Thank you, mrpdean, for your Lakeview Manor Evolution - Modders Resource Version (http://www.nexusmods.com/skyrim/mods/41645/) . Thank you, Jokerine, for your Jokerine's Misc Resources (http://www.nexusmods.com/skyrim/mods/53022). Thank you, RefurbMadness for your Refurb's Resources (http://www.nexusmods.com/skyrim/mods/64268), Cherrywood and Mahogany Alchemy Tables (http://www.nexusmods.com/skyrim/mods/57412) & Cherrywood Dragon Enchanting Table - Resource (http://www.nexusmods.com/skyrim/mods/54291). Thank you, LilaMue for your Edles Silberbesteck - Noble Silver Cutlery (http://www.nexusmods.com/skyrim/mods/46454/). Thank you, berticus0001 for your Berts Bits And Bobs Resources For Modders (http://www.nexusmods.com/skyrim/mods/36756) . 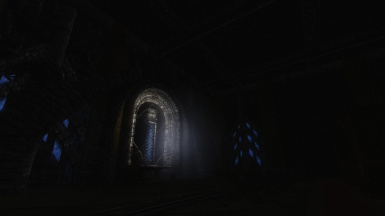 Thank you, mr_siika and Kraeten for your Griffon Fortress Resource (http://www.nexusmods.com/skyrim/mods/41036). 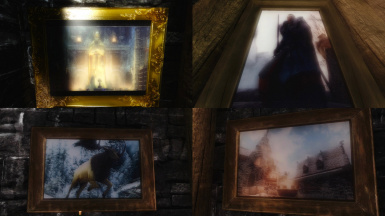 Thank you, BetterBecause for your HQ Frames and Canvas (http://www.nexusmods.com/skyrim/mods/60246/). 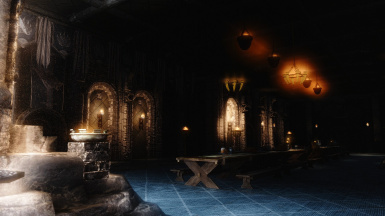 Thank you, SrRamrod for your Stained Glass Lanterns 2.0a (http://www.nexusmods.com/skyrim/mods/64110). 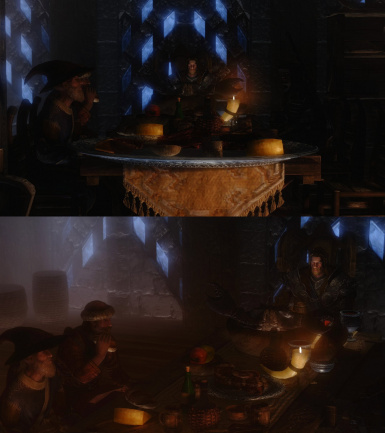 Thank you, monk_ide for your Upper Class Furniture Pack (http://www.nexusmods.com/skyrim/mods/63255/?). Thank you, Nightshade, "Solitude HD Gate" (http://www.nexusmods.com/skyrim/mods/49829). Thank you, Denki Groove, for your "Handbag Addicts" (http://www.nexusmods.com/skyrim/mods/41280). Thank you, Rand0mNumbers, "Frying Pan Weapons" (http://www.nexusmods.com/skyrim/mods/19246). Thank you, JadeRoyale, for your "Pottery Recolor" (http://www.nexusmods.com/skyrim/mods/40736). Thank you, Darkfox127, for your Creation Kit Tutorials and Resources (http://www.nexusmods.com/skyrim/mods/53956) and your great video tutorials. Thank you, IndyCurt, for the beta testing for Royal Blue Palace.